Terrifying, I know, but I must urge you to maintain your composure. Variations on this theme appeared for last year’s Halloween, so it should be of no surprise that these have returned. And, since Halloween is an occasion where people usually dress up as things that they are not, having these costumes poses no major threat to our subculture at large. Steampunks who are dedicated to the subculture will continue creating and making amazing things regardless of whether or not corporations think they can make a profit off of our look long after Halloween comes and goes. So while these costumes are somewhat disturbing to our unique subculture and style, I don’t think it’s cause to “jump airship” so to speak. That certainly doesn’t mean you have to take anyone who actually expects you to take these sorry excuses for a Steampunk fashion statement seriously. Still, be nice to them. 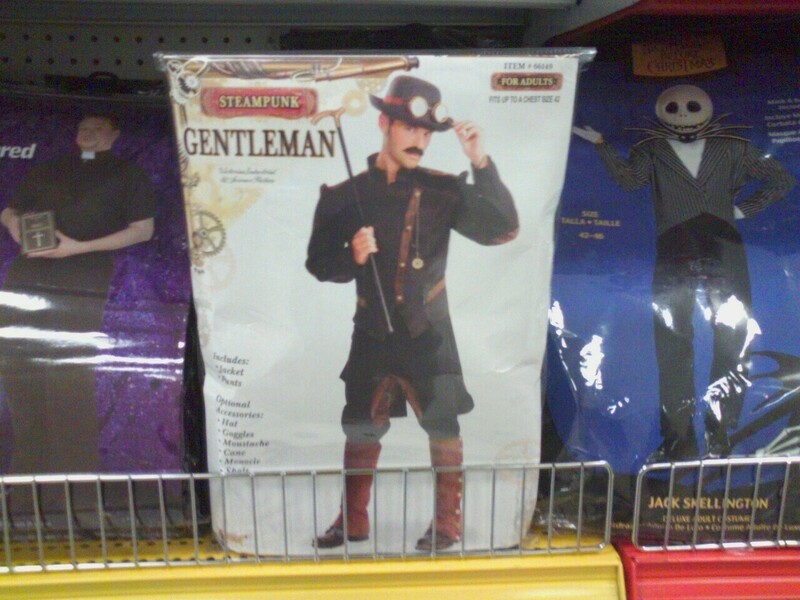 They may be new to the subculture and be unfamiliar with how un-Steampunk it is to buy your “costume” in a prepackaged set from Wal-Mart. And, if they just don’t get it, that’s fine too. It’ll all be over on November 1. While I myself do not consider goggles an absolute necessity to Steampunk fashion, there are few pieces that so enhance a Steampunk’s overall presentation as a pair of impressive goggles. Finding that right pair of goggles, however, is something of a challenge. You want them the be as unique as your own style and definition of Steampunk, but finding that perfect pair is difficult when a lot of goggles that are available these days just have gears glued to the sides of a standard goggle. Thanks, but no thanks. The goggles created by atomefabrik, however, are works of art. Gorgeous in their handcrafted detail, these goggles are sure to give you the exact look that you want. Check out the full image gallery for goggles to see all the wonderful designs. autonomous= AtomeFabrik is a small business , independant, free of any constraint set by a conservative marketing line or enchained to some bank loans. By “small” I mean = I do the work alone, designing, engineering, manufacturing, packing, web design, emails, and all the cleaning…and I don’t want to grow big. manufacture= all items are handcrafted using craftmanship processing, which means conventionnal machining rather than high productivity stamping or CNC machining; bolting and riveting rather than robotic welding, hand assembly etc…human “imperfection” rather than mass production ! Like any craftmanship this manufacturing work comes at a cost. Generally speaking by buying from a craftsman you contribute to the making and the perpetuation of unique and true skills that would desapear otherwise, because, honnestly, that’s the way it is. Amazing art and a fabulous philosophy behind it. Be sure to check it out! As promised, today’s post features the masculine aspects of grooming oneself during the Victorian era. Again, our dear friends at Sepiachord have trolled through the recesses of the internet to help make sure that all you Steampunk gentlemen are looking your finest. Taken straight from the pages of the ‘London Academy of Gentlemen’s Hairdressing,’ the Sepiachord DIY Vintage Mens Hairstyling Guide has tips for haircuts and all manner of facial hair styles. Be sure to check out the full guide for all of Sepiachord’s useful tips and tricks to being immaculately groomed. And after you and your lady are finished with your hairstyles for the day, be sure to check out the rest of Sepiachord for some awesome recommendations, reviews, and interviews from the world of Steampunk music. Back when I was first getting into Steampunk, I was faced with the conundrum of trying to decide how to style my hair in a sufficiently retro-punk fashion. It’s a lot harder than it seems on first glance. Everything I found seemed to lean in too much towards one look, and finding a balance between those two aesthetics was increasing frustrating. I finally got to the point where I simply decided to let my hair be as it is inclined to be on its own: long and naturally curly. Victorians loved their curls, and the fact that my hair just comes like that seemed good enough reason to me to just leave them be. But for most people, curls aren’t something that comes with genetics. It takes a lot of product, pinning, and patience to get that perfect look, and when you don’t really know what you’re doing, it makes the whole process considerably more frustrating. And trying to explain to a hairstylist precisely what you want can sometimes be hit-and-miss, and almost always expensive. My dear friends at Sepiachord have come to your rescue, though! They recently added a DIY Vintage Ladies Hairstyling section to their website, which instructs you on how to create a Basic Curl, a Pin Curl, and a Scripture Curl. There’s also useful information to help you get that perfect style though creating and overlapping curls. Check it all out here. And stay tuned tomorrow, when we’ll cover vintage hairstyling for men, also brought to you by our friends at Sepiachord. Attention all Seattle Steampunks! For those of you wishing to learn how to craft the perfect petticoat to go with your steamy wardrobe, you do not want to miss this upcoming workshop. Somewhere in Time, Unlimited (SITU) is presenting a Petticoat (1890-1910) Workshop as a two part series, on Sunday, July 17, 1:30 pm – 4:30 pm at a branch of Seattle Public Library. Or, in a few days, SITU will have a PayPal button for this workshop on the SITU website that you can use to register for this workshop. Somewhere in Time, Unlimited sponsors historic costumed social events in the Seattle vicinity which reflect the most enjoyable aspects of past eras, so there’s a lot of cross-over in interests between the Steampunk community and Somewhere in Time. Be sure to check out their website for all sorts of articles and information on upcoming workshops and events.